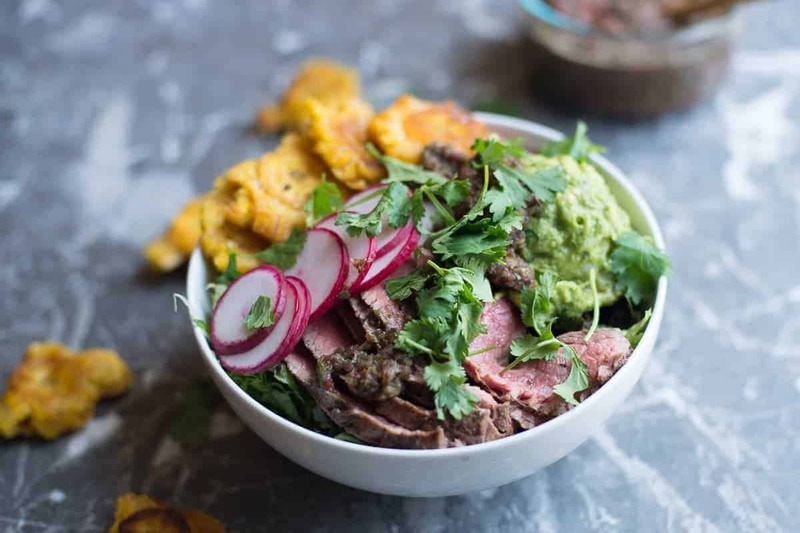 This spicy, protein-packed steak chimichurri Beast Bowl is perfect for any meal. Always remember you can eat this on a plate too! This grilled steak chimichurri Beast Bowl is satisfying in so many ways. First, grilled marinated flank steak. This lean cut of meat is an easy and affordable way to get in your daily protein. Second, the spicy chimichurri sauce is a win-win that can be eaten on steak, chicken, fish or veggies. Grill the meat, then let rest. Get all of your bowl fixin’s ready to go. To make tostones – all you need is about a half a cup of coconut oil (heated on medium high) and a few green plantains. Peel them and cut them in 2-inch pieces. Fry for a few minutes on each side, Next remove and smash the plantain slices between two plates. Then, return smashed plantains back into the hot oil. After a few additional minutes on each side, they will be nice and crispy. Remove from the oil and place on a paper towel lined plate. Sprinkle with coarse salt. Flank steak is a lean cut of meat. It’s really tasty if it’s cooked correctly; which is hot and fast. Your fire should be hot. Grill the flank steak for about 2 minutes on each side for medium rare. The key to getting steak done to the right temperature is to first bring it to room temperature before you grill it – then cover it and let it rest. Resting allows the juices to settle back into the meat. The meat actually continues to cook just a bit after you take it off the heat. As the meat rests it will reach the correct doneness and perfect juiciness. Make the steak marinade and add flank steak. Marinate the steak for at least 2 hours. NOTE: All steak should be at room temperature before you throw it on the grill. Bringing steak to room temperature ensures that it will be cooked to the proper internal temperatures. Heat grill to High. Grill the steak on a very hot grill, for 2 minutes each side. Remove the steak to a platter. Cover and seal with foil. Rest for 10 minutes before slicing. Add all of the ingredients to the bowl of a food processor. Add all of the ingredients to a medium bowl and mix with a fork until still chunky, but blended. Peel the green plantains, cut each one into 2-inch pieces. Set the pieces of plantain in skillet flat side down. Remove the browned plantains from the oil and place on a plate. 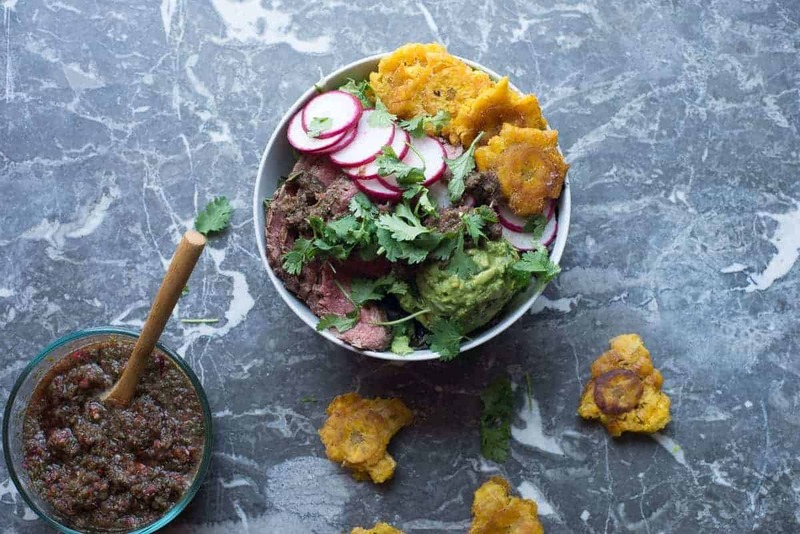 Top with steak, Columbian guacamole, chimichurri and of course tostones.